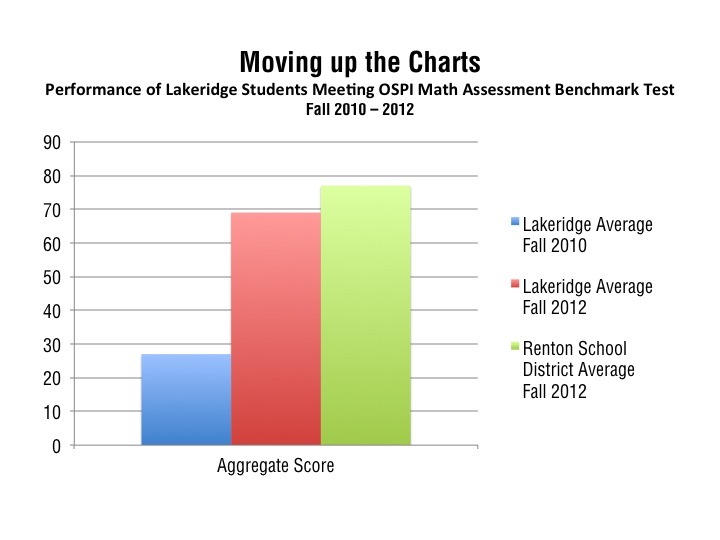 In 2010, approximately one in five Lakeridge Elementary students was passing the state mathematics assessment test. Working with strong instructional leaders, a school improvement grant, and Lakeridge’s phenomenal teachers, Dr. Elham Kazemi’s team helped these classes see gains that are approaching or outpacing the district average on math benchmark assessments. Dr. Kazemi’s collaborative team includes Dr. Allison Hintz from UW Bothell as well as a cadre of graduate and postdoctoral students. As Dr. Elham Kazemi states, "Our work at Lakeridge shows the value of collective learning. When teachers and school leaders are focused on helping students make sense of math, the sky is the limit." The staff agreed to a transformation model. A rigorous, research based, job-embedded professional development effort focused on cultivating a school-wide commitment to, adoption of, and continued experimentation with ambitious teaching practices was designed and implemented. Together, they asked the question: How do we build strong school-wide professional communities, especially in high-poverty schools where there is enormous pressure to better serve students and improve their educational outcomes? After one year, we saw significant gains in both state and project-based assessments. More importantly, classrooms cultivated a culture of reasoning and enthusiasm for learning and engaging with mathematics. No one expert has all the answers. But through collaboration and ambitious teaching practices, we can benefit students and help fuel their passion for learning.